The top 2 seeds made their way to the final, which will be contested by Phil Ogier and Dawn Morgan (pictured) next Saturday evening. Ogier was in convincing form all evening and did not drop an end during his wins over Peter Powell, Martin Sarre and Mark Pipet. Morgan had a tricky first match against 5th seed Jez Powell, but she navigated this well by winning through in 5 games. Her opponent in the semi final was unseeded Derek Webb and she came through this encounter in straight games. Top seed and defending champion Paul Hainsworth will play against the unseeded Ben Foote in the final. 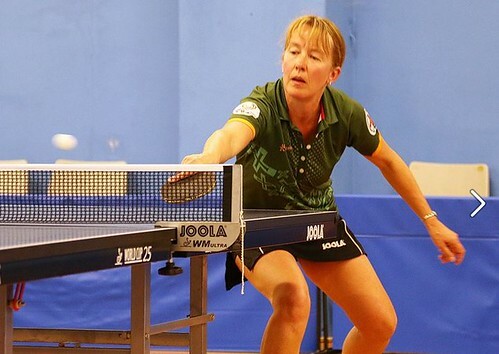 Hainsworth recorded comfortable straight game wins over Jenny Powell and Emma Webb to reach the final. Foote caused an upset by defeating 2nd seeded Jamie Ferbrache in the quarter finals, over 5 games. He followed up on this with a matching 5 game win over his Mixed Doubles partner Paula Le Ber in the semi finals.